Cat won't stop meowing? 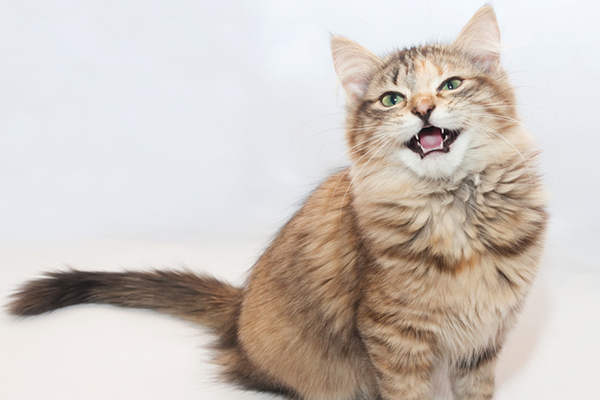 There might be more to your cat meowing all the time than nonstop vocalization. Find out if all that cat meowing signals something serious like a medical condition. 1. All that cat meowing means your cat is in heat. Your cat might be meowing if she’s in heat. Photography by annadarzy/Thinkstock. Of course, this is reason for a cat meowing is true if your cat is not spayed. But if your five- or six-month-old un-spayed cat won’t stop meowing, your cat might be in heat. Cat in heat sounds are eerily loud and almost sound as if the cat is in pain, and they’re usually accompanied by super-affectionate behavior and an odd, sway-backed position when you pet near the rump. 2. Excessive cat meowing could signal hyperthyroidism. Typically found in older cats, hyperthyroidism displays a number of symptoms, including weight loss despite ravenous hunger, excessive activity and excessive vocalization. If your cat is showing these symptoms and your cat won’t stop meowing, take her to the vet right away for a checkup and blood test. 3. If your cat won’t stop meowing, it could signal loss of vision and/or hearing. If your older cat won’t stop meowing once you’ve turned off the lights and gone to bed, she may really feel lost. A cat who’s partially blind or deaf won’t be able to make her way through the house and may not be able to hear you. 4. Senile cats meow a lot. Yes, cats can become senile. 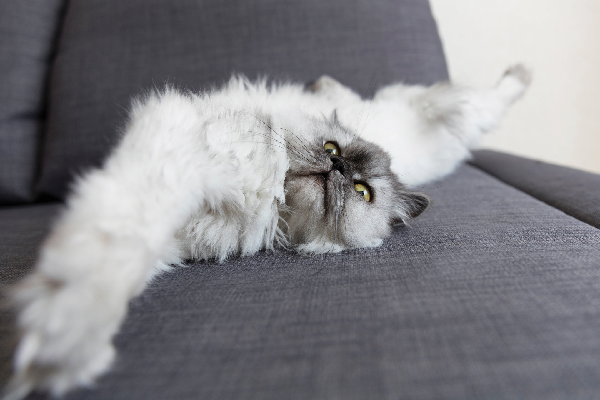 This condition, known as feline cognitive dysfunction or cat dementia, can cause a number of problems that will leave your cat feeling scared and disoriented. Her response will be wails, yowls and excessive cat meowing. 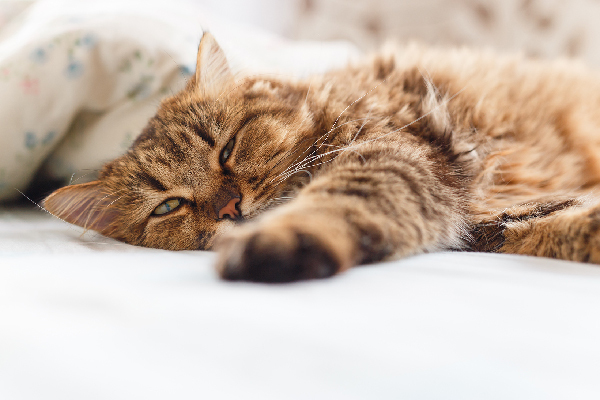 A cat with cognitive dysfunction may also become more irritable, sleep more or have altered sleep cycles, lose coordination, and even on occasion become incontinent. 5. 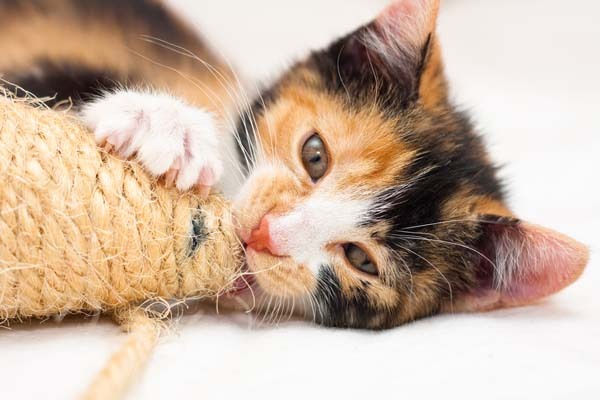 If your cat won’t stop meowing, she could have feline hyperesthesia syndrome. A cat with this condition will sometimes get wild-eyed and just go nuts, almost as if she’s hallucinating. She’ll cry and yowl loudly, may have bizarre mood swings, her skin may ripple as if even the air hurts her, and she might have sudden fits of grooming herself like crazy, even leading to hair loss. 6. Cat meowing might signal pain. 7. Your cat is meowing due to loneliness or boredom. Single cats who are very closely bonded with their caretakers are particularly susceptible to loneliness or boredom. This kind of constant cat meowing or crying usually starts after you go to bed and continues until you respond or she gets tired of calling out for attention. If a cat won’t stop meowing because she’s lonely, these tips from the ASPCA may be helpful. Or, consider adopting a second cat. 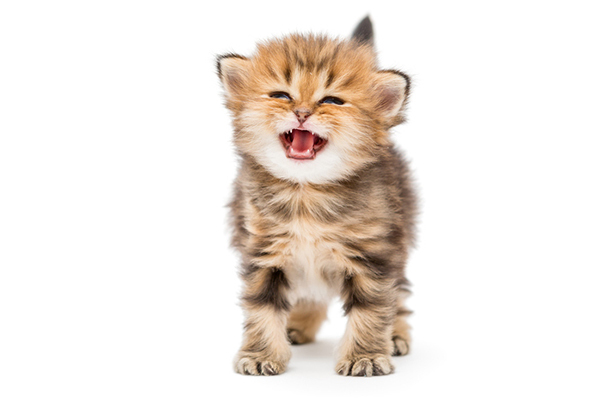 Tell us: Cat won’t stop meowing? Have you found the cause of all that cat meowing yet? Tell us about it in the comments! It has to be because of loneliness and boredom. Ever since my cats friend ran off, she started meowing and before her friend ran off, she hasn’t made a single meow. He ran off about 4 days ago and he usually comes back 2 days after he runs away. Me, my cat and my sister are worried. My parents are saying that he is fine. My cat started to meow at a wall that her friend always sleeps right next to. I’m worried about my cat and her friend. Could it be serious? I have a 7 year old Tom cat, over the past 2 months, he has just wondered around the house crying. He wants let out the fount door, then goes straight around the back and comes in the catflap ? He is well fed, he sleeps at night, he has always lived with 2 other cats, they are fine, and they all get along together. He follows me when I walk my dog. Don’t know why he seems so unsettled? My neutered cat was 14. Multiple vet trips, lots of tests. Ended up being hyperthyroidism. Apparently this is not a test done in routine lab-work. A separate blood test, I would have happily authorized, had it been suggested right off the bat. Happily we eventually got there. We caught it far enough along that he qualified for Radioiodine therapy and early enough where his kidneys would tolerate it. He is now fat and happy. 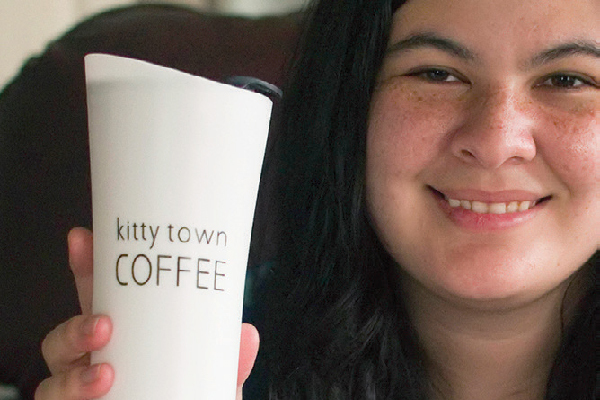 Glad to hear kitty and owner are doing well. Peter and Brutus. Or is it Brutus and Peter? My black female cat, 3 years old, neutered, meows every day. At 6 AM and at 5PM give or take 10 minutes. She won’t stop until I feed her! Without fail!! My 14 year old cat has always been a meower, but since the death of his “sister” about two weeks ago it has become louder , more constant and different in tone (more of a yowl than a meow now). I think hes lonely during the day without his companion. I’ m not sure how to help him. He probably is looking for his sister. Once I had 4 cats raised from birth and all was fine until the last one was left. She walked around upstairs letting out cat call types of meows. They say, if possible, show the cat the dead cat so it understands it’s gone. Anyways, two weeks later she started losing weight and ended up being put down. It all happened so fast. Here I thought she’d be happy to receive all the attention and I was wrong. Maybe get another cat companion for him, but hope they get along, like my two don’t. Best of luck to you. Find him another cat. Kittens adapt easier and my older cats (One is now 20.) never minded the age difference. They seem amused by the new baby. get him another companion? there’s always cats out there man. My cat is 7 years old, the only one left of the litter no one adopted so I kept her. She basically ignored me, all she cared about was her mother. Last year her mother died and she’s constantly meowing at me. Follows me around, practically under my feet. Keeps taking me to the kitchen, yet she’s not hungry and doesn’t want treats. She’ll do this for hours every day. It’s been a year, shouldn’t she be over her mourning? She had a thyroid test so it’s not that. I play with her a lot. I have another cat too, but she torments that cat who is scared of her. I have to keep them separated. She sleeps very good all nite. How can this be corrected? Or can’t it. It sounds like your kitty just wants a lot of affection / attention! I have a 20 year plus kitty grey tabby , who just showed up and never left she was already spayed. Tentative to men, but took to me 20 years ago. Now she is showing her age. She is screaming, almost wailing multiple times a day. She is still alert, eats a lot. Is 6.8 lbs. Uses a box . She is getting hard of hearing and seeing. She was testing for a thyroid problem but the meds almost killed her. She takes blood pressure meds. She doesnt sleep all that much in my opinion. I love her but it’s getting hard. We dont sleep much either. I have select nite lights around the house so she can see. I feed her when she wants . 1x in am , treats when my husband gets home and gain w me. I give her a small portions She is on rx food for renal care. Can I give her cbd oil? Would that help her? She came to me on her terms. She will leave me on hers too. Great article. It sounds like it might be time to put your kitty out of her misery. Sometimes it’s hard to remember that we need to think of the kitty’s well-being more than our own well-being. Best of luck to you and your baby. We have a Siamese kitty that’s roughly 7 years old. She just likes to meow. Constantly. She’ll have a toy in her mouth and meow while running around with it (it’s adorable). She’ll also just sit on our bed early in the AM and “chirp” until one of us wakes up and pets her. Certain breeds are just very vocal. She’ll meow just to hear herself meow I swear. My cat also meows with her toy in her mouth running around. I’ve duscovered it’s her way of asking me to play with her..As soon as I do play the meowing stops.. Please discuss with a vet or behaviorist if this continues to concern you! And i mean everytime. She often sits right next to me just meowing, she meows when I pet her ect. she never meows when shes in another room only when she’s with me. Sometimes im scared she’s trying to tell me something imporatnt and im missing it.. Is it just cause she’s talking to me and being social ? If you believe there could be a problem with your cat, we suggest bringing your cat to the vet to be checked. My cat tells me when her litter box needs to be cleaned by going to each side of her litter box and sniffing it if she smells urine she will find a place in my house to go so I wash her litter box with soap and water really good. and if I dont get to it right away she will let me know by constantly meowing. onceit is cleaned she is fine. We have 2 cats, 1, five yr old female rescue and 1 male, 3 yr old that we found outside. I estimated the male was about 3 months when we found him. The problem we have is the male goes around crying A LOT! I try to play with him, give him attention, (even tho he prefers my husband), but that’s not what he wants. He’s healthy but very vocal. He doesn’t want to be touched much. Is there something I’m missing? He’s not a cuddler at all. I’ve never had a cat that behaves this way. Any advice would be helpful. Thanks! If this behavior continues we suggest contacting your vet again to find out what to do. My 1 year old indoor female cat ( already neutered) goes through “crying” meowing phases during the evening. She is always in the same place when she does it and lasts a few minutes. I dont know why she is meowing or how to help her. Thanks for reaching out! We suggest taking your cat to the vet to make sure there is no underlying medical issue. My 2 year old female cat is driving me crazy!! She has been spayed. She was an orphan kitten that I rescued from PAWS. I am home with her most of the day. The vet said she is healthy. But she meows so much it’s just driving me nuts…she has always been this way. If I approach her, she runs away. I honestly don’t know what to do…her litter box is always clean and she’s never out of food or water. Please help!! We suggest contacting your vet to ask for advice on what to do if this behavior continues even though your cat is healthy. I adopted a male from the local animal shelter, and he was very quiet in the beginning but as he got closer to me he became very vocal when he just wanted Lovins! I began asking him when he meowed so loudly, if he wanted some Loving?? He would meow until I gave him the eye to eye look and petted & talked to him, then he purred alot and became quiet. Also when he is hungry he tells me. I have had cats all my life and never had such a vocal one. I really like it because it lets me know what he wants and sometimes it reminds me to LOVE on my cat! I live alone and it is comforting to hear & know he loves me & needs me! I Love My Vocal Cat!!!! my kitty cries by the door of the apartment around 6:45 every single night. She is super healthy, moderately affectionate, and well cared for….she’s just a vocal cat. I have 2 cats who “talk” to their toys. One has a toy mouse, the other talks to a neck pillow, which he plays with like a kick toy. They carry them around, meowing. One meows at the back door (they were both rescues). I think he hears some other animal (cat, squirrel, rabbit, chipmunk) on the back porch and wants to investigate. They want to give you a gift and consider you a parent. They don’t always bring it to you. Any strays who show up and hang around my house during winter get a warm box and daily food and water. One year, a large tiger male showed up (Charles Todd aka Big Head Todd), and a few weeks later he was joined by a smaller orange and white companion. Given that oranges are usually male, kitty was named Oliver. Oliver was scrawny but fattened up from my food. Then Oliver began to expand sideways. That’s not from food! OlivETTE produced four lovely kittens in April 2016. Charles Todd disappeared, and Olivette & Co came inside, where they remain today. Olivette is not yet spayed. She’s not yet tame enough for me to get her into a carrier. I can’t pick her up. She comes to me to be petted, flops on the floor and lets me pet her belly while she makes air biscuits, but freaks if I try to pick her up. She’s skittish and freaks out when I stand up, and once she got so freaked because I yelled “no!” at one of the kittens who was about to wreak disastrous havoc that she hid for two days straight (and peed all over an afghan I’d been crocheting). In two years of living with me, this is as tame as she’s gotten, despite my trying very hard to connect. I’ve no idea how old she is–at least three, given that the kittens are two now. She has a cloudy spot on one eye and may not be able to see really well–and she is a MEOWER. I know why her previous people put her outside. She meows INCESSANTLY. And insistently. I call her the Cat Alarm that goes off every hour or so. I tune it out; I can live with it. But I can understand some people might not have been able to. I doubt she’s in heat all the time. She can’t be lonely with four other cats around. She isn’t lonely for me. She was maintaining weight nicely, but lately she’s gotten skinny again. She’s been treated (stealth) for fleas and twice for worms… I’ve no idea what it is, but hyperthyroidism makes sense. Cross your fingers that I can shove her into a carrier and that we can both survive the vet trip. And the aftermath (no 72-hour hiding, please). I have to herd our semi-feral brother & sister pair into a smaller room (bathroom works best) and close them in with me. I have the carrier in there and accessible for them. Usually works out ok. When we moved, for the 3rd time in 5 yrs, I herded them to an empty bedroom and after seeing ne catch the male in a carrier, thr female ran into the other empty waiting carrier. Was easy the last time. Different breeds are so amazing. My Cornish Rex, who is 10 among my other kids knows he rules. They have a yell not like any other cat it is nowt a meow , and every morning at 4 am, he gets in bed and screams at me – which is “Feed Me” – now. However, i tell him to wait a bit until 5 a.m. and he knows that’s where we are at. They are an extremely vocal breed and i have noticed as he is getting a bit older – he has alot more to say. He must be loved every day and snuggled every night even more. They are quite the characters. Our 17 year old cat, George, lost his best buddy in May. We have two more female cats that don’t really care about snuggling/sleeping with George, so he’s been meowing alot lately when he’s not able to sit on our lap or getting attention. Brought him to the vet and he was diagnosed with high blood pressure, so he is on medication, but he still meows alot. Was thinking about getting a kitten for him, but not sure if the kitten would take to George. It’s always a dilemma with cats, since they are very complex critters and you never know how they’re going to get along. Any other suggestions? My cat Lila lets out a little meow when she preparing to jump on my shoulder – this could happen anywhere in the house!! My cat Baxter meows LOUD when he wants me to clean his litter box! He has me trained …..
One of our cats meows REALLY loud when she’s about to bring you a present. The present is usually a toy but can sometimes be a twist tie, milk ring or other object she’s found laying around the house. She’ll drop it at our feet, leave it somewhere we’ll find it or jump up on the couch/chair and drop it in our lap. She also meows really loud after she’s used the litter box. That also includes zooming around the house in a state we call “Poop-phoria.” Hee hee. Our 5 year old cat has a small furry ball that she plays with. She holds it in her mouth and meows loudly. Our cat brings us things as well. Clothing items, plastic bags, tissues (he once emptied an entire box), hair ties, etc…He yowls loudly when he does it. This started about 5 years ago when he was 9 years old. I am a new foster Mom to a Mother Cat and her 3 healthy kittens. I’ve had her for almost 2 weeks and I think she is going crazy being locked up in the guest room. It’s a complete cat room that just happens to have a twin bed in it. They have everything they could possible need in there and I feed her every 4-6 hours because she is skinny and always acts like I haven’t fed her in days. She has been meowing A LOT ever since we got her, but today she is pacing and busted out of the room twice. She came back when I rattled the spoon (food). I am giving her the good milk supplement and good food (kitten food and grain free). ANY suggestions would be greatly appreciated as MY 2 cats are not happy with the situation. Thanks!!! PS. She is recently spayed and her kittens are about 6-7 weeks old. I have 2 cats, they are 3 months old, females. One of them is very quiet and doesnt need much attention, she likes me but she wont complain or meow if i dont give her my 100% attention. The other one is super attatched to me, always comes to me and tríes to climb on my lap, follows me everywhere and in general she is constantly in need of affection. This is starting to be a problem because the cat meows non stop during a lot of time if im in my room studying alone (I cant study or work with the cat because its very distracting) the thing is the meowing drives me Crazy. Is this Just because she is a little kitten? Another curious fact is that the other cat(the one that its not so attatched to me) pisses on my bed, and I dont understand why. They always use their litter box(which i clean daily and is in a private Spot for the cats to do their business private) but from time to time the cat comes and literally pisses my bed right in front of me (this has happened 3 times over the last week), I had Another cat before and this never happened to me. My best guess is because they are 3 months old they are Just like Kids Trying to draw attention. Any thoughts, advices or tips would be most appreciated. Thank you. My 6-year-old cat, Kit Kat, has always been talkative, but over the past year she has gotten worse. She doesn’t seem to sleep as long as her companion, a 5-year-old cat, and is the more energetic of the two, so while she mostly meows for more food, sometimes it seems like she’s bored since the other cat doesn’t play as much as she wants. Basically, if Kit Kat isn’t playing or sleeping, she’s meowing. Each cat has a timed feeder that turns 3 times a day. The other cat eats and then goes on with her day till it turns again. But Kit Kat just keeps meowing and meowing. Even a half-hour after eating, she’ll immediately be begging again. The vets don’t think it’s hyperthyroidism because she isn’t losing weight – I actually had to put her on a diet, which stopped her from gaining additional weight but made the begging even worse. What should I do? She has an extremely loud, high-pitched meow (her only volume is SCREAMING), so she is giving me headaches and driving me crazy! My cat is a 10 year old cat and he’s meowing non stop hiding out in the corner of our basement what should I do? My older cat was hiding and meowing, and quit eating, too. I scheduled a vet appointment, then the cat “laid” a huge stool! I took the cat in anyway, along with the stool sample. Most likely he ate something that caused a blockage. Since he tends to have hard, dry stools, I gave him more moist canned food and cut back on the dry food. Also a mild stool softener (recommended by the vet) every other day. No more blockages! My 19 year old cat meows continuously and is throwing up a little bit of blood now and again. Only sleeps maybe a few hours at night…….. is my cat in pain? Hi Debby— Sorry to hear that your cat isn’t feeling well. We suggest taking him to the vet. Is she spayed? If not, all the meowing could be because she’s in heat. My cat is 7 months old and he meows for hours in the mornings and won’t let me and my boyfriend sleep. He always has food available, he’s not in any pain or have any illnesses/health issues, and he doesn’t want any attention. Why is he meowing so much? I am dealing with exactly the same thing. My cat starts his meowing at about 5 in the morning and doesn’t stop until about 8. It’s like clockwork every morning. He has food and water always! Because he only does it during these morning hours and not at any other point in the day I don’t feel as if he is sick…Is he lonely? Does he do this because his owners are asleep and he wants constant attention? I am at a loss. Help!! He is also about the same age. Less than a year but over six months. Why do you use the feminine pronoun “she” instead of the neuter “he”? “He” is masculine but also neuter. The neuter pronoun refers to male and female, while “she” refers only to females. If you think you are doing it only to counterbalance the masculine “he” and don’t acknowledge “he” as neuter, then using only “she” is just as bad as using only “he” all the time. Ridiculous. Actually, I switch back and forth between articles I write. In some cases, I refer to a cat as “she” and in other cases I refer to a cat as “he.” I also don’t believe that “he” is neuter. If I wanted to go with neuter, I’d say “they,” which is, in fact, grammatically correct these days. But this isn’t a forum for grammar discussions which can veer into political ones, so I’ll keep my comment at this. My 5 year old cat, Bear, has been doing the constant meowing thing about 5 or 6 months now. He has been to the vet twice now. Nothing is physically wrong with him. He also is a bit more aggressive. By that I mean that if he is frightened or threatened even slightly, he is likely to bite or scratch or at least growl and lunge. Essentially, he has become high strung and jumpy. I take it as a good sign that he never does a whole lot of damage, so he must be trying to warn me without hurting me. He always was a bit more aggressive/feisty than any other cat I’ve had, but it is worse now. I enjoyed his “cattitude’ before but it’s out of hand now. I got him at 16 weeks and he was initially an only cat. I doubt if it’s any trauma from prior to me having him. Maybe he was a semi-feral kitten? I got him in the shelter with no history given to me except he came to the shelter alone no siblings, no Mama. He was about 1 1/2 yrs old when I introduced 2 year old Bella to the house. She’s much more mellow. I bought a house and we moved in 11 months ago. Maybe it’s that change but the crying and nervousness didn’t start right away. Maybe it’s the giant owl statue the neighbor has on the fence that I know Bear doesn’t like that keeps him so worked up. He hisses at it when he sees it. Possibly, it’s another predator outside. I haven’t seen a stray cat in my yard, since we first moved in, but there is something burying poop in my yard, could be a stray cat or a bobcat since only cats bury poop with cover up marks around it, not that I can do anything about that except maybe close the blinds at night so they can’t see it. Maybe Bear’s just bored and restless and I need to play with him more. Yesterday, at the vet , he was so freaked out he attacked me twice and also my other cat. The vet had to wrap him in a towel just to get him into the carrier. This is not a new vet but Bear was never like this at the vet before. He has been going there since he was a kitten. He’s usually curious and explores the room. The vet prescribed kitty prozac for him. I don’t think I’m going to get that filled, now that I think about it. He isn’t that unmanageable at home, if I stay away when he’s “in a mood”. The biting doesn’t happen that often and it doesn’t upset me too much. If you have cats, you get used to the occasional scratch or bite. They get their tails stepped and even the calmest cat will get ya. My house is generally calm with only me and my adult son ( who Bear thinks he belongs to). Bear usually gets along with my other cat just fine. They play together and lay and stand close to each other, so I know they are comfortable together. They have three or four litter pans for two cats and yet they use them all interchangeably, another sign they are ok with each other. My cats have a lot more space in the new house. They have 2 new cat trees in addition to the old one. I got those to give them some vertical space as Jackson Galaxy would suggest. They have two cat fountains, lots and lots of toys and are generally spoiled. They don’t go outside,except a roll on the patio once or twice a year. They do get to go in the garage, which they seem to think is “outside” to them. They have lots of interesting wildlife to watch in the windows like quail and lizards. Hi there — We suggest talking to a vet for advice. Best of luck and hope your kitty feels better! My cat won’t let me do paperwork or sew at my machine. He gets right on top of it. He get right on top of my fabric, I’m afraid he will stick his paw under the needle so I stop seeing. Finally he gets bored and leaves . Is your cat neutered? If not, that could be the reason for his meowing. This rings very true for me, my senior kitty just suddenly started meowing in the hallway like she was lost, it was such a sad noise. We took her to the vet and she had hyperthyroidism, sadly also feline dementia, she was 19 and broke my heart when I had to put her to sleep. She went from being a happy healthy senior cat, to a mere shadow of her self, incontinent, scared, bewildered in the space of a few weeks. She was the furry love of my life, and I still feel like I didn’t do enough. Please don’t feel that you “didn’t do enough” for your kitty. You gave her a long and happy life filled with love, and no one could possibly do more. My sympathy on the loss of your dear friend. I have lost dear animal companions-from horses to cats-and understand how heartbreaking it is. Take comfort in knowing what you did for the animal for all those many years. While the pain never really goes “away” it does change over time, and becomes sweet and bearable. No matter how much we do for our pet, I think we all feel like we didn’t do enough, after the fact. You did do enough, because you loved your pet. It’s just a part of grieving to feel that way. I feel like I didn’t do enough for every cat I ever had and, for that matter, I feel like I didn’t do enough for human relatives that I’ve lost. I try to just focus on how much I loved them, fur family and human family alike. I try to put that much more love into the fur babies and human family I have left because, in the end, it’s too late to change anything you feel you did less than perfectly and it will drive you crazy thinking about it. If you just love(d) them, then you did enough leave it at that. Hope that helps. My female rescue snowshoe will go into my bedroom and, after a few minutes, start meowing. I call it “yelling” for me because if I call out “I’m in here,” she comes running. My cat does not meaw at all, when he does its very low, is that normal? renay, our rescue is the same way. Cinci only meows when she wants to be played with, and either has a shoe-string in her mouth that she is bringing to us to play with her with, or has the shoe-string in front of her, and is waiting for us to come and play with her. She doesn’t ever meow for any other reason, whether she is hungry, or anything. We don’t know if whoever left her in the rest area she was found in, attempted to do something with her first, and damaged her vocal chords, if it’s a genetic thing, if it’s just part of her personality, or some other reason. e have never had her neck x-rayed, as we don’t currently have the finances for that, as both I and my significant other are on disability, but she doesn’t have problems eating cat food, and she has a much better life now than she would have, had she not been rescued (my significant other’s vet said she would have died within 2-5 days, had she not been rescued), and all of the vets I have since taken her to have all said she’s one of the happiest cats they’ve ever seen. So if your vet doesn’t have any concerns, you probably should not be concerned, either. I hope this helps allay any fears you may have about your kitty’s “quietness”. Right on point with the hearing/vision loss and the cat dementia. My kitty Molly lost most of her hearing in the past year, and is starting to lose vision in one eye. She gets “lost” in the dark especially, and it’s really sad to hear her cry for help. I love her dearly, and she is otherwise very sweet and playful. The vet tells me she is extremely healthy for her age besides those symptoms. She eats great, eats people food, uses the box just fine, etc. It’s just that she is 21 years old. Lennie is a 4- year old mostly grey shorthair. She is such a chatterbox! She meows loudly while carrying her stuffed toys. Or looking out the window. Or just walking around the house. Her weight, appetite and litterbox droppings are normal. The vet said she’s a pefectly healthy young cat. Most interesting is how she will go from what sounds like crying to purring once she is petted. She will roll over on her back and let you rub her belly, which she loves. What she doesn’t like is to be held although she purrs like crazy when she is… I’ve had cats for years and have never experienced this behavior in any of them. Her sibling Bella is a quiet, happy lap cat. Her other housemate, Calli is fairly quiet also. Only Lennie is the spokescat of the group. I’m at a loss to explain this other than she just has a lot to say. Hi, I would like to know the reason why my cat is always crying in the middle of the night banging on the door and wanting to go out. Everynight I have to pick him and place him far away from the door but within an hour later, he came back to the door and start crying and banging. I am not sure if it cause of boredom because I had a a 2nd cat to keep him company. But he still wanting to go out from the house every single night. Please help me solve this . It has been disturbing my sleeps for a year. Is your cat neutered (“fixed”)? If not, this could be a reason for his vocalization.